Game theory is an excellent topic for a non-majors quantitative course as it develops mathematical models to understand human behavior in social, political, and economic settings. The variety of applications can appeal to a broad range of students. Additionally, students can learn mathematics through playing games, something many choose to do in their spare time! This text also includes an exploration of the ideas of game theory through the rich context of popular culture. It contains sections on applications of the concepts to popular culture. It suggests films, television shows, and novels with themes from game theory. The questions in each of these sections are intended to serve as essay prompts for writing assignments. Many colleges offer courses in quantitative reasoning for all students. One model for a quantitative reasoning course is to provide students with a single cohesive topic. Ideally, such a topic can pique the curiosity of students with wide-ranging academic interests and limited mathematical background. This text is intended for use in such a course. This text may also be appropriate for a high school enrichment course. Students can work through the text independently or as a class. The questions throughout the text help students discover the key ideas themselves. Although the materials have been classroom-tested, this PDF version is still in a draft form. A full instructor's guide, which includes classroom activities, discussion questions, key ideas, solutions, and other implementation suggestions, is available to verified course instructors by emailing the author. An interactive version of this textbook is available online - see the Links section below. Jennifer Firkins Nordstrom is Professor of Mathematics at Linfield College. She holds a Ph.D. in Mathematics from the University of Oregon, an M.S. in Mathematics from the University of Maryland, Baltimore County, and a B.S. in Mathematics from the University of Redlands. 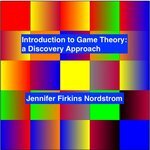 Nordstrom, Jennifer Firkins, "Introduction to Game Theory: A Discovery Approach" (2018). Linfield Authors Book Gallery. 83.